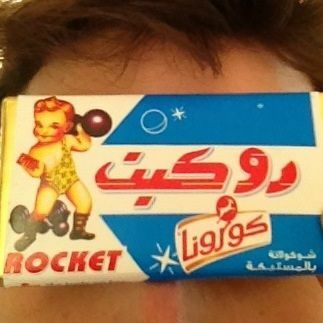 Rocket, the most aesthetically appealing of the Egyptian candies. As a foreigner in Egypt, I have always been fascinated by the world of non-imported candy. Finding these candies was a true quest, with such beloved favorites as 5×5, Bimbo, Magic Gumb and S&S seemingly unavailable in any of the ten-plus candy vendors in my central Cairo neighborhood. With this, we shall dive into the confectionary archipelago that is Egyptian local candies. The Om Kalthoum of Egyptian candies. Ubiquitous and inexpensive, Kata-Kito is delicious, if not altogether excellent. Embossed with the trois couleurs (the three colors of the French flag) around the edge of its bronze wrapper, Kata-Kito shares Egypt’s strange sense of Francophilia. At its core, Kata-Kito shares a lot of similarities to its decadent Western cousin, the Kit-Kat. It is chocolate surrounding a few stacks of thin wafer cookie. Kato-Kito is less dense than the Kit-Kat, which keeps the wafer from overpowering the delicate chocolate notes. Further, a Kit-Kat is easily divisible into four pieces, much like foreign hands wish to divide Egypt. Kata-Kito is one solid block, lest we underestimate the power of nationalism and confection. As a child growing up in America, I faced numerous bourgeois/first-world problems. An example of this was the lack of a milk chocolate bar with coconut filling. I like to think that this has prepared me for a life where we are constantly forced to choose between imperfect and unsavory options throughout our existence, despite seeing a third, better way. Yet Egypt does possess Gersy, which is the milk chocolate-coconut candy bar I longed for in my youth. Gersy isn’t amazing. Upon moving to Egypt I also discovered that England produced a possibly superior milk chocolate-coconut combo, because of course England has found a way to create a rational candy bar that America couldn’t. However, Bounty — England’s (imperialist) cousin to Gersy ​— costs eight times more. This justifies Gersy’s existence, and allows Gersy to score higher in the “Manga Taste/Cost/Speed” index than its Union Jack competitor. Gersy is extremely chewy, and does in fact have seemingly real coconut flakes. The wrapper claims that this is “Original” Gersy, which makes me think that there might have been some sort of “New Gersy” experiment in the 1980s, which clearly the masses rejected and declared illegitimate. The chocolate is a little powdery and not very smooth. Gersy does the trick though. Some may scoff at you and tell you to buy a Bounty bar due to Gersy’s deficiencies. When someone does this, just proceed to eat all eight of the Gersy bars you bought for the same price as a Bounty in front of them. Gersy is produced in Egypt by Kraft Foods Egypt S.A.E., which means that unfortunately foreign fingers have in some way penetrated this sovereign dessert. However, it’s safe to say that this subsidiary has at least a significant percentage of Egyptian stakeholders, and thus we can take pride. There is a lot going on with Rocket. It is by far the most aesthetically appealing of the Egyptian candies. Its retro-style wrapper features stars and a planet, seeming to insinuate the ecstasy of cosmic travel one will feel when eating Rocket. The wrapper then proceeds to get quite strange. There is a strawberry-blond child dressed in a single strapped bathing suit holding a barbell in one hand. I assume this is because not only will Rocket take you to the moon and back with just one bite, but you will return to earth as the westernized ideal of a toddler, who also possesses abnormal strength/taste in clothing. Even weirder, in the child’s non-barbell wielding hand lies a candy bar that is NOT Rocket. Rocket also isn’t great. It consists of milk chocolate around a caramel center. The chocolate is nice, but extremely hard and sticky caramel filling makes eating Rocket a chore. A pro tip: Keep Rocket in the refrigerator in order to harden the caramel to the point that it easier to break off and process in your mouth. Unassuming in its description (biscuit wafer-filled and coated with chocolate), one would be forgiven for passing over this delicacy, or thinking it a simple candy. Oh, but my comrade in sweets, you would be mistaken. Shamadan is the kind of worker-poet-candy not even Engels could have imagined. Beneath its kitsch wrapper featuring pseudo-argyle-three dimensional typography lies a complex and delicious treat. Having experienced the semi-hollow and airy eating experience that is Kata-Kito, also produced by Shamadan, I prepared myself to be underwhelmed. How wrong I was. Shamadan wafer snack is thick and filled with flavor. Its chocolate contains the exquisite trait of being both sweet and buttery. When one lets it sit on one’s tongue for a moment, all its true essences arise. The texture of its wafers is the perfect combination of crunch and chew, enough to feel like a proper bite; yet it doesn’t linger around in your mouth, like your friend who doesn’t know when to go home so you can make out with a potential love interest. At the cost of LE1, Shamadan is a king amongst the plebeians of the snack world — or possibly the head of the candy polit-bureau. Widely available at your local corner retailer, it is a welcome purchase whether you need something to calm the taste buds after an intense meal, or just get change to pay for a taxi. Our world faces many questions regarding globalization, capitalism and the tragedy of life. Egypt must make difficult and painful adjustments to its economy in order to remain competitive globally, and also prosperous for all its citizens. Its current subsidies have created a system that is simultaneously exploited by the rich, while perpetuating an environment that holds down sustainable economic inclusion for the poor. Yet, Egyptian candies, no matter their foreign competitors or changes to domestic economic policies, are ready to stand on their own. By combining taste, value, ease, and at times superior aesthetics, these snacks appeal to both the gourmand and the frugal, a duality which bodes well for their continued success. While Kata-Kito, Gersy, Shamadan and Rocket may serve the role of temporary gastronomic opiates, their sweetness fleeting after a few bites, they also remind us of Egypt’s proud past, and potentially glorious future.